Review date: 17 May 2001. How do you connect a portable computer to a normal keyboard, mouse, parallel printer, serial modem, LAN and a couple of USB gadgets? With seven cables, of course. Plug plug plug plug plug plug plug, and you're done. Until you need to move your portable computer, whereupon you unplug unplug unplug unplug unplug unplug unplug, and then plug plug plug plug plug plug plug again when you come back. Even quite basic laptops these days can be had with built-in network adapters, and many of them give you a full suite of normal back-panel PC connectors as well. But if you're carrying the laptop around all the time and have to plug umpteen things into it daily, it can get a tad tiring. You can solve this problem with a docking station. Most laptops can use one. The station has a full complement of ports, and when you clip the laptop into it, they all start working normally. 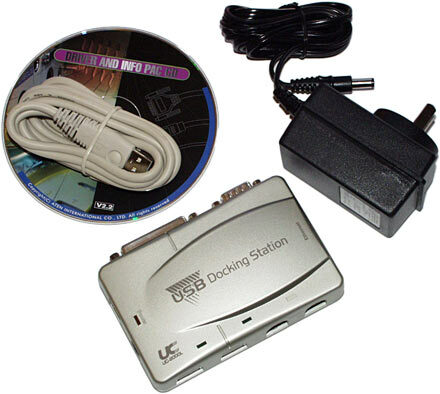 You leave your peripherals plugged into the docking station when you're out and about, and no cable-wrangling's necessary to connect them all. Clunk, click, away you go. Now, that's all very well, but docking stations are not cheap. 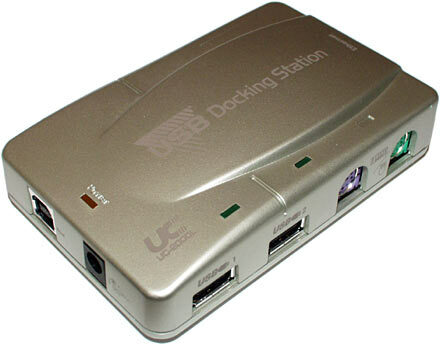 Plain ports-only docking stations will set you back maybe $AU300; ones with a network adapter (a $AU30 item if you buy it as a card for a desktop PC...) included cost $AU700. And ones with PCI slots built in can cost considerably more than a whole basic desktop PC. Higher-end laptops come with a docking station; cheaper ones - and by "cheaper", here, I mean "still the price of a stacked desktop system, than which no current PC will be faster" - don't. And, of course, if you want to plug the laptop into two desks full of gear - at work and at home, say - you'll need to buy another docking station, because carrying a docking station around defeats its purpose. Since laptops are all proprietary boxes, you can't shop around for a cheap off-brand docking station. If you've got a Toshiba laptop, you need a Toshiba station, and the same goes for Compaq, Dell, IBM and everybody else who makes portable PCs. This makes the idea of a one-box solution for all of the popular peripherals rather attractive. It could connect to the laptop via USB. You can get USB network adapters, and USB keyboards and mouses, and USB-to-parallel and USB-to-serial adapters, after all. Why not put all of that stuff in one box? The Aten UC-2000L USB Docking Station is the sensibly priced ($AU220, delivered) alternative to a proprietary docking station. It connects to a Windows PC with one USB cable, and it provides two USB ports, PS/2 mouse and keyboard ports, a nine pin serial port, a 25 pin IEEE-1284 compliant bidirectional parallel port, and a 10BaseT network adapter. The "L" on the end of the UC-2000L's name indicates the network adapter; there's a plain UC-2000 as well, with everything but that. The UC-2000L isn't a "port replicator", like normal docking stations; its ports aren't the same ports you get on your laptop relocated to some other place. They're extra, new ports, so most computers will end up with a second printer port and a second or third serial port after installing the docking station. The new ports should work just like the normal ones in Windows, though. The UC-2000L thus offers a cheap-ish solution for laptop users who want to connect lots of gear easily. It could also be quite handy for desktop computer users who want a one-stop gadget that gives them a plethora of ports. Here, from left to right, are the USB input connector, the barrel plug socket for the AC adapter, the two USB ports and the two PS/2 ports. And on the other side of the UC-2000L, there's the RJ-45 jack for the network cable (complete with activity lights), the serial port, and the parallel port. The whole thing is 111.5 by 72 by 27.9mm (4.4 by 2.8 by 1.1 inches) and it weighs 150 grams, not counting its lightweight switch mode plugpack power supply. It comes with a six foot USB cable. Portmanteau USB devices like the UC-2000L are easy enough to install in Win98 and later flavours of Windows. You just plug 'em in and point Windows to the driver directory on the included CD, when it asks. You need drivers to suit the Windows version you're running, and Aten provide Win98 and Win2000 drivers for the UC-2000L. Setting up multi-function USB gadgets in Windows is, however, not the most elegant procedure in world history. Connect the UC-2000L and Windows is convinced you've just plugged several things in simultaneously. So it goes through its new hardware detection procedure over and over. Since the UC-2000L has a particularly enormous number of heads as far as Windows is concerned, the OS will go through the hardware-detection-and-installation process for the network adapter, the serial port, the parallel port, the keyboard and mouse interface, and the USB hub. The hub and keyboard/mouse interface use drivers that are built into Windows (you don't even have to do a driver search for the hub), but everything else needs the CD. The UC-2000L driver CD's one of those one-size-fits-all jobs with a separate directory for pretty much every one of Aten's multitudinous products. Pick the appropriate subdirectory of the "UC2000L" directory whenever Windows needs to find a driver, and you're fine. It's generally not a good idea to restart every time Windows says you need to in order to "finish installing your new hardware"; put off the restart until Windows isn't detecting any new bits, then restart, and you'll minimise the install time. Once you finish the installation, an imposing amount of the entries in the Windows Device Manager will belong to the UC-2000L. The stuff that's not greyed out here is just the actual "useful" device entries the UC-2000L provides, and not the further system-level entries you can see by looking in "System devices". It all, pretty much, just works. The USB ports are normal self-powered hub ports into which you can plug any USB device, including another hub. 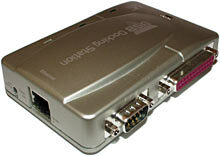 The network adapter's like any other 10BaseT one. The parallel and serial ports work as you'd expect; you may even be able to use the parallel port with storage devices like a parallel Zip drive, though I wouldn't bet on it. The standard parallel port on your computer (if it's got one) will very likely be faster, anyway. Plug a keyboard and/or mouse into the PS/2 ports and they'll appear, to the computer, to be plain vanilla USB Human Interface Device (HID) Compliant gadgets. This may make it difficult to fully use multiple-button fancy-mouses, but any PS/2 mouse will definitely work for ordinary pointer moving and left and right clicking, and your plain three-button wheeliemouse should also be fine. Handily, there's a recessed button next to the network cable socket for waking up a portable computer that's decided to put its keyboard or mouse in sleep mode, but which doesn't hear the signals from the PS/2 ports on the UC-2000L. For general computing, the UC-2000L seems to work fine. But you can't pile all of that stuff into one little USB-connected box and expect no hassles at all. If you want DOS support, for a start, you can go whistle. The extra ports show up in Windows, and they show up in a DOS session opened from within Windows, but they're not there if you boot DOS - which includes restarting Win9x in MS-DOS mode. Even when the ports are visible because Windows is running, DOS software may refuse to deal with "LPT2" and "COM3", if it's hard-coded not to understand ports with IDs higher than the usual numbers. You'll have the same sort of problem if you want to use the UC-2000L on anything but Windows 98 or 2000. You'll need equivalents for all of the drivers that come on the CD if you want to use all of the features - the PS/2 and hub features should be fine on a Mac or with Linux, but the other stuff I don't know about. You may also lose performance if you're using lots of USB stuff simultaneously. USB's maximum bandwidth, while we wait for the up-specified USB 2.0 standard to hit the streets, is a not-very-exciting 12 megabits per second. A single device can move around three quarters of a megabyte per second of real user data. Now, 10BaseT Ethernet's bandwidth is 10 megabits per second, so it doesn't take too long at the abacus to calculate that the network adapter can, by itself, eat most of the bandwidth between the UC-2000L and the PC. The PS/2 and serial ports aren't an issue; they don't need much. But a parallel device can pretty much use the whole of the available bandwidth as well, if it's a storage device or a modern lots-of-data-flow printer that uses the PC to do much of its thinking. And, of course, the USB ports on the UC-2000L can themselves accept full-bandwidth devices, which have to share the pipe too. In practice, this all isn't likely to matter very much. If you've got a mania for USB connectivity and, for instance, use a USB network adapter when there's no need to, then you're not going to get system performance as good as you'd enjoy if you laid off the hot-swap gadgetry and bought cheap expansion cards instead. This applies particularly for network connectivity. Lots of Local Area Networks (LANs) these days use the 100BaseT "Fast Ethernet" standard, with ten times the peak bandwidth of 10BaseT. No USB network adapters support that mode because USB doesn't have a fat enough pipe, so you're definitely better off with a different kind of network adapter, if that's an option. All that said, though, even if you totally load out the UC-2000L and have all of its ports doing stuff at once, it'll still work, and for productivity-software purposes will be fine. Normal users won't be likely to hit the bandwidth limit often, and won't be likely to notice when they do. The network adapter won't interfere with mouse or keyboard behaviour, so the UC-2000L's a perfectly all right option for hooking your network-card-less laptop up to a LAN for games. If you do that, though, you won't want to be using a PS/2 mouse through the UC-2000L. The PS/2 converter gives the mouse a lower-than-30Hz sample rate - the pointer position is updated fewer than 30 times a second. That's right down there with the nasty jumpy rate of a serial mouse. Many users don't care about a low sample rate - well, not until they switch from their old mouse to a USB one, or a PS/2 one with its sample rate tweaked up past 100Hz, and suddenly notice that moving the cursor across the screen quickly doesn't give them only about four images of the pointer on the way. But gamers really want a high mouse sample rate, for responsive control. And the UC-2000L won't give you that from a PS/2 mouse. As is normal for protocol-translation mouse interfaces, you can't use a tweaking utility to boost the sample rate, either. Of course, there's nothing stopping you using a USB mouse through the UC-2000L. That'll work fine, at the standard 125Hz Windows USB mouse sample rate. Only if you're using the PS/2 converter do you get the crummy rate. If you've got a desktop PC, you probably don't need this thing. If you for some reason want to add all or most of the stuff that the UC-2000L offers to your desktop computer, though, the thing's well priced. A USB-to-serial adapter's more than $AU75 by itself, a USB network adapter will cost you maybe $AU10 more again, and a hub with serial and parallel ports is more than $AU170. This all-in-one option, if you've got a use for it, is a bargain at $AU220. If you're a laptop user who really wants a docking station but doesn't want to pay highway-robbery prices just to get a pocketful of convenient ports, check this thing out. It's cheaper than any big-brand docking station I've heard of, it does much the same thing, and you can fit it in your pocket. Although you will need another pocket for the plugpack.